Howard and Martha Head (Colorado Ski Museum photo). Since switching to Head skis in 2010, Park City’s Ted Ligety has won an astounding 16 World Cup races – including a giant slalom by an enormous margin of 1.51 seconds in St. Moritz on Sunday — and claimed four gold medals at the World Championships. Ligety is a heavy favorite in the GS at the 2014 Sochi Winter Olympics – an event never won by an American man. In fact, the only Olympic GS medal ever claimed by an American was Bode Miller’s silver at the Salt Lake City Games in 2002. Miller, who’s been racing on Head skis for years, is looking to build on his American record of five career Olympic medals. And both Ligety and Miller – gold medalists in 2006 and 2010 respectively – have a chance to become the first American men to ever claim two Olympic gold medals in alpine skiing. On the U.S. Ski Team alone, four Olympians with a total of 10 medals — Miller, Ligety, Andrew Weibrecht and Julia Mancuso — will be racing on Head skis this month at the Sochi Games. That stat would have jumped to five American Olympians and 12 medals if Vail’s Lindsey Vonn had been able to come back from injury. And that’s a tally that doesn’t even include Olympic gold medalists and overall World Cup champions Aksel Lund Svindal of Norway and Maria Hoefl-Riesch of Germany, who also both race on Head skis. Or the potential for more medals in new Olympic freeskiing events like halfpipe and slopestyle, where competitors like Crested Butte’s Aaron Blunck — a Ski and Snowboard Club Vail athlete – ski on Heads. “Wouldn’t he be thrilled now?” said Martha Head, recalling how her late husband, Howard Head, cried tears of joy when a young Swiss racer, Joos Minch, won a race on a pair of laminated, aluminum-alloy Head skis in the early 1960s. But even more thrilling for Howard, Martha added, was the way the skis revolutionized the sport for recreational skiers back in the 50s and 60s, providing them with a product that was just as durable as wood but so much easier to turn. “Before Howard invented the metal ski we only skied on wood skis, and they had no torsional rigidity,” Martha said. “You just went down the hill. He brought that ski to the fore and influenced thousands and thousands of people who will never know it and don’t know exactly how it happened, but he did it. “And how did he do it? With a remarkable work ethic,” Martha said of the former aeronautical engineer from Baltimore who produced the first metal ski in 1950. “He was there morning noon and night working constantly on his ski, and he had a lot of disappointments in the early days. They broke in half and they did all kinds of things, but as time went on the ski got better and better.” Head skis officially arrived in 1963 when the Swiss national team started using them. Howard, who died in 1991, was inducted into the Colorado Ski and Snowboard Museum Hall of Fame the following year. On Tuesday, Feb. 4, from 5 to 7:30 p.m. at the Sebastian Hotel in Vail, Martha Head will be honored with the Colorado Ski Museum’s Lifetime Achievement Award (email skimuseum@gmail.com or call 970-476-1876 for more information). The following day there’s a reunion of current and former Head employees on Vail Mountain. Martha, who’s now married to renowned orthopedic surgeon Dr. John Feagin and still lives at the base of Vail near the “Head First” ski trail, moved here in 1970 with her first husband, Jack Fritzlen, with whom she had three daughters. Fritzlen designed and built sophisticated electronic law-enforcement equipment in what’s likely been the ski town’s only manufacturing firm, and Martha ran the company for more than three years after he died in 1984. 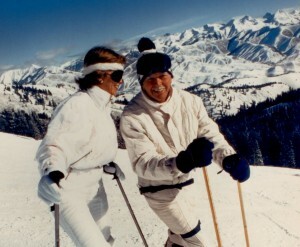 Meanwhile, Howard Head sold his ski company to AMF in 1969 – a “big mistake,” according to Martha. “He sold his company and he was a little bit at loose ends because he didn’t have a job,” she said, “so he decided to build a tennis court in his home.” And that new passion led to his purchase of a Princeton, N.J., tennis ball machine company for $27,000. That led to Prince Manufacturing and a racquet patent that had companies such as Wilson paying royalties to Head. His racquet hit the big time when 16-year-old Pam Shriver used it to upset Martina Navratilova in the 1978 U.S. Open before losing to Chris Evert in the final. “That started the oversized racquet, and he was selling all kinds of them to individuals like myself, who were poor, pitiful tennis players but loved the large racquet,” Martha said of Howard’s second phase of life. Head’s third phase came after he met and married Martha in the mid-1980s, lost a kidney and had to go on dialysis three times a week for three hours. He used the time to reinvent himself, reading the classics, listening to opera and engaging in some serious self-examination. “He started to think about his own life, about his value systems, about how generous he had been and how he wanted to be more generous and help to make this a better world,” Martha said. “It never stopped him. In 1987, he started the Howard Head Sports Medicine Center and “he supported a hundred other things that nobody knows about, my favorite being the Head Theater in Baltimore,” Martha said, adding that spirit of giving touches her to this day. Editor’s note: This story was produced for the Colorado Ski & Snowboard Museum and a version first ran in the Vail Daily. The museum is located on the third level of the Vail Village parking structure, adjacent to Vail Village Covered Bridge. It is open daily from 10 a.m. to 6 p.m. For more information, call 970-476-1876 or go to www.skimuseum.net.